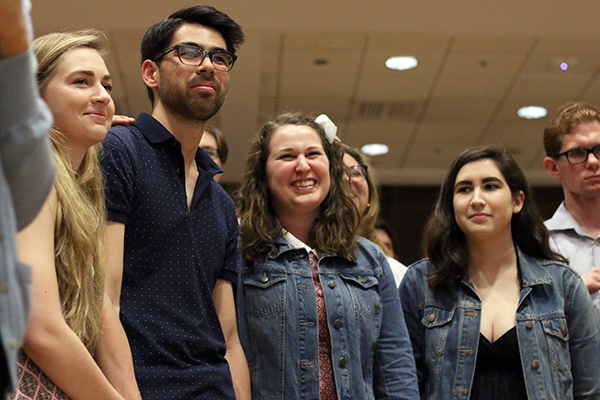 Junior Erika Feinman, center, won the Student Association presidency with about 53 percent of the vote. Feinman spent $478 on their campaign. Student Association presidential hopefuls spent less on their campaigns this year, in line with a commitment to making the elections more affordable. Erika Feinman, who won the SA presidency with more than 53 percent of the vote, spent about $478. That total is about $100 more than Feinman’s competitor, Christina Giordano, who spent $357, according to financial expenditure reports. This is the first year the caps for candidate spending have been lowered. In January, the SA senate passed a resolution capping campaign spending at $600 instead of $1,000 for presidential candidates. All three of this year’s candidates said they would be open to lowering the limit even further. Feinman, who uses “they/them” pronouns, said they stayed under their $500 budget, spending more than $400 on three different orders of palm cards from FedEx and $13 on a dry erase board and chalk, although they did not end up using the chalk. “We decided to put my platform on the palm card because we wanted as many people to read about my ideas as possible. We purchased enough palm cards to dorm storm in almost every single dorm and to stand in Kogan and hand out palm cards for the entire week of the election,” Feinman said. Giordano said she didn’t think being outspent by her opponent made any difference in the election. “I would like to believe, at the end of the day, it’s your ideas and the platform that you put out that cause you to win, not how much money you spent,” she said. Giordano said she went slightly over her planned budget of $300, but still wanted to remain well below the maximum. She spent almost $230 on posters and palm cards and about $24 on a GoDaddy website domain name and a monthly fee for website design. This year’s candidates’ spending was on par with last year’s winners. SA President Andie Dowd spent less than $500 on her winning campaign last year and former Executive Vice President Casey Syron spent about $200 – less than any top candidate that year. Still, the candidates said the cost of a campaign is an obstacle for many students who want to run for student leadership positions. Thomas Falcigno, who ran unopposed for executive vice president, said he didn’t spend any money on his campaign. “In order to advocate for affordability, you need to make sure there are affordable ways for students to get into positions of advocacy,” Falcigno said. Still, he said candidates had to spend some money in order to reach the roughly 25,000 graduate and undergraduate students eligible to vote in the election. Before dropping out of the race, presidential candidate Tony Hart complained that some students said he was “too poor to run for president.” Hart had said he would not spend any money on his campaign.